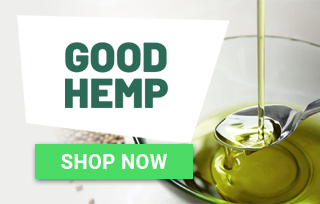 Good Hemp UK is not a traditional CBD oil company in the fact that, well, they don’t actually sell CBD oil — or any other therapeutic CBD products for that matter. Rather, this unique brand specializes in the formulation of high-quality hemp-based food and drink products, creating an ultra healthy ‘menu’ of nutritional options that you can add to your daily diet routine. Who Is Good Hemp UK? Good Hemp is a UK firm based out of county Devon, Tawstock. The company was originally started in UK, but they have since outsourced much of their growing operations to Canada, China, and other parts of the EU due to the fact that the United Kingdom is not really an optimal climate to grow bountiful amounts of hemp crops outdoors. While most CBD oils and other CBD products are made from the leaves, stem, and flowers of the hemp plant, Good Hemp utilizes the seeds due to their astounding nutritional value; including both the outer shell and the inner “heart,” hemp seeds are composed of roughly 35% essential oil, 25% protein, and 29% dietary fiber. It is in utilizing these nutritional benefits that Good Hemp is able to supplement a small stock of top-shelf food and drink products with healthy, 100% natural plant extracts. In fact, hemp seeds are such a quality source of protein that they contain all 20 amino acids that the body needs for nutritional value – the same protein that you would find in a chicken breast, for example. Our Good Hemp review not only tried and tested the complete range of the firm’s products, but also made an effort to understand the production processes of the company in an effort to truly gauge the quality of the brand’s food and drink items. Here are five things that stood out to us in terms of what separates Good Hemp as a leading, top-shelf hemp seed operation compared to other brands in the UK. Privately owned company. In today’s ultra-competitive climate, it is no doubt rare to find a company that remains indepently-owned without getting bought out by a larger corporation. By remaining private, Good Hemp is able to keep much of their operation localized in Devonshire, UK, while still maintaining top-shelf quality for every food and drink item produced. Small range of products. Good Hemp doesn’t manufacture a wide variety of products, and the fact is they don’t need to. By offering hemp-based protein supplement, hemp hearts, cooking oil, and hemp milk, they pretty much cover all of the nutritional bases hemp nutrition. Transparency. One thing we really appreciated throughout our Good Hemp review was how transparent and honest the company aspires to be. They have an in-dept FAQ page that aims to answer most any customer question, and they even go in to precise detail as far as the manufacturing process of their top-shelf hemp milk. Large-scale goals. Good Hemp believes that “the more people have hemp in their lives, the better,” and it shows in their large-scale goal of wanting to see hemp become a staple food, drink, and cooking item in kitchens not only across the UK, but across the world as well. Indeed, it is well-documented that the nutritional benefits of hemp can have positive effects on brain, skin, and heart health, among other things. Affordable prices. You would think that a top-quality company like Good Hemp UK would be so pricey they are not even affordable to the average consumer base. However, this is not at all the case; in their effort to see hemp become a staple food and drink item across the country, Good Hemp strives to make all of their products affordable, and they have done so with great success. Really, the only negative thing we could think to come up with during our Good Hemp review was that the firm currently only ships to the UK. They don’t exactly clarify the reasons as to why on their website, but as far as we know they are not able to ship to the US or to other parts of the world. Their products can, however, be found in a variety of health and natural grocery stores across the globe. If you follow my personal blog and social media pages, you’ll know that I’m quite the cooking fanatic. As such, Good Hemp honestly seems to be a match-made-in-heaven type brand for me personally, as I love incorporating the goodness of hemp/cannabis into fun, unique, and healthy dishes. I have used the Good Hemp oil to fry everything from fish to corn tortillas, and have even added it to tea and coffee for a unique supplement of Omega-3 and 6 acids. And of course, I absolutely adored the robust taste of the hemp hearts and the variety of options for the hemp milk, which I continue to use routinely in my morning oatmeal and porridge concoctions. And of course, the hemp protein supplement can be used to make any range of delicious hemp-based food and drink items, though most will prefer to mix the supplement in a blender to create a healthy non-dairy based smoothie. Hemp Oil (for cooking). As I’ve said, I have used the Good Hemp oil to cook in all the same ways that I would use an olive or coconut oil, and the subtle taste is balanced perfectly for dozens of dishes. I still use my staple olive oil routinely, but it is clear that hemp cooking oil offers many more health and nutritional benefits, and is probably much more advantageous in the long run. Nutritional Hemp Seeds. Hemp seeds are actually the basis for every single Good Hemp food and drink item, but the firm also offers the seeds by themselves that can be utilized for a huge range of uses. They are jam-packed with 100% natural plant-based protein, Omega acids, and fiber, and are a true “powerhouse” of a food. Hemp Protein / Nutrition Supplement. Good Hemp protein supplements contain all 20 amino acids that the human body needs/uses for protein building, and thus are perfect for muscle recovery, pre-workout, or simply as a staple food item for vegan diets to ensure that they get enough daily protein intake. They also offer a “Raw” version that is supplemented with fiber for a more complete nutritional experience. The “Pure” hemp protein packs a monstrous 75% protein content, while the “Raw” contains 50% protein with added fiber. They also offer a strawberry-flavored shake mix for easy, delicious shake making in a blender. Hemp Milk / Hemp Drink. 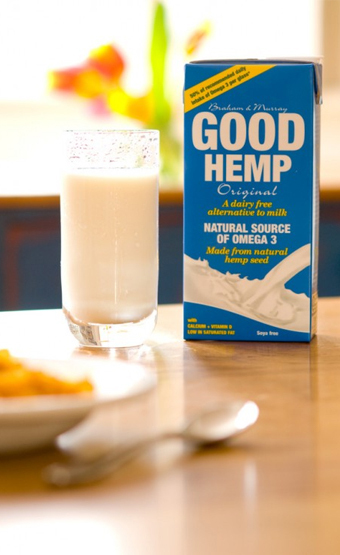 It was evident during our Good Hemp review that hemp milk is one of the staple products of the firm, and they offer four different low fat, dairy-free options that can be used in cereal, oatmeal, smoothies, tea/coffee, or anything else that you’d otherwise use traditional milk for. The hemp drinks are also enriched with calcium and vitamin D to ensure that customers get the complete “milk” nutritive experience. Hemp “Combo Packs.” Good Hemp sells each of the above items individually, or you also have the option to buy one (or several) of each in discounted combo packs. Hemp Oil (for cooking). 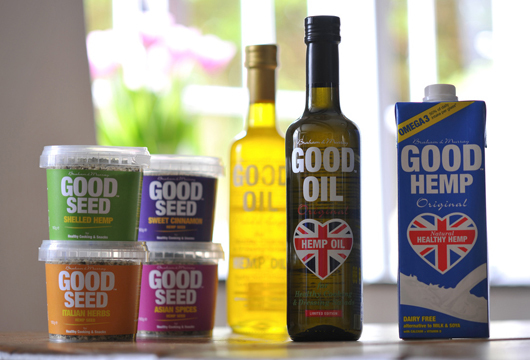 Good Hemp cooking oil runs either £4.49 or £5.99, depending on whether you get the 250 mL or 500 mL bottle. Nutritional Hemp Seeds. 225g bag of hemp seeds costs just £3.99. Hemp Protein / Nutrition Supplement. The Good Hemp protein supplement comes in three different options: “Pure” (75% protein), “Raw” (50% protein w/ added fiber), and “Strawberry” (a flavored smoothie mix). Each are available in either 500g or 2.5kg tubs, and range in price from £13.49 to £49.99. Hemp Milk / Hemp Drink. Individual bottles of hemp milk start at £1.60 (1 L), and run up to £20.27 if you buy in a combo pack. Hemp “Combo Packs.” Good Hemp “Health and Well-Being Packs” contain one of each of the Good Hemp food and drink items (one bottle of culinary oil, one pack of hemp seeds, one tub of protein powder, and three liters of milk) for just £20.27. All in all, if you are a resident of the UK and have been looking for a quality, affordable option for hemp-based food and drink items, then you really should be looking no other place than Good Hemp. Waitrose and Sainsbury’s are the firm’s two main retail distributors, but their full range of products can be found in other locations as well, in addition to being able to be ordered online. The hemp based protein supplements from Good Hemp is ideal for a post workout remedy. It gives me a good quantity of protein and helps relax my muscles. I love the new website, the designs look amazing and it definitely feels like a company worth buying from. Being a fan of healthy cooking oil like extra virgin olive oil, I was really interested to try out Good Hemp cooking oil. Initially I was sceptical as to how the food will taste but to my utter surprise, the food was perfectly balanced in flavor. I decided to vamp up my gym routine and begin using the Hemp Protein powder, I like it…it’s just as energising as other powders and possibley better for me? Emmitt from Ashburn just bough! Journee from Ashburn just bough! Paisley from Ashburn just bough!